WHO’S COMING UP ON MARCH 18? Taking a big step off the beaten path keeps the EKK program fresh and alive for the coordinators and volunteers at E Kanikapila Kakou. We did exactly that at the 8th Monday night session by inviting some new faces who had not performed before at EKK. All from Kaua’i; all on the youngish side; all performers with their own circle of fans; all excited to be on our stage . . . and all won their new audience over with their performances. Keikialoha Kaohelaulii from the Kanahele ‘Ohana of Niihau, was the first on piano and vocals. 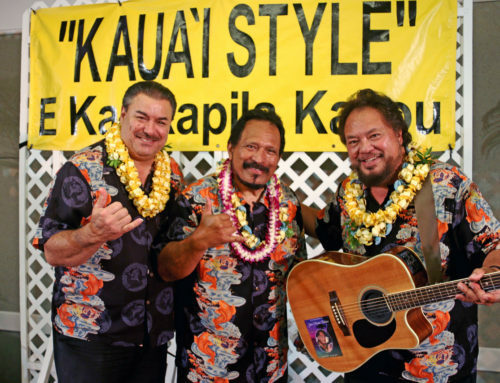 He had actually performed with the Triple T’s and his Niihau ‘ohana several years ago where he charmed the audience with his Hawaiian piano playing. When he was a youngster, he was forbidden to touch the piano, but talent finds a way to emerge, so today the piano is his instrument of choice. This time he chose to sing some of the songs that are part of the repertoire at the Waimea Niihau church. Every Sunday morning at 9:15, the congregation sings Father, Thy Paternal Care, a hymn from Ka Buke Himeni Haipule; this he shared with us. The person who had the most influence on his upbringing was his great grandmother Mama Ane Kanahele, who has composed many of the songs sung by the Niihau community. Aloha Kaeo, is one of the well known songs that he sang next. He recalls a visit to Lana’i island where his entire ‘ohana sang Helu ‘Kahi (Ku’u Ho’omana); unfortunately, in this day of easy access to recording media, there is sadly no video recording of that occasion. He introduced the next artist on the program. Kimberly Hope, who has been making waves all over Kaua’i with her violin, most recently at a concert titled Night of Original Music together with Violinist Aowl Owen backed up by a mini orchestra at the Kaua’i Christian Fellowship in Koloa. Her violin selections included an original song titled Find Yourself, the first song that she composed. It’s a song about finding out more about herself. She seems to be on the right track as she is an elegant artist, so in touch with her instrument. She plays with ease and artistry – dynamic, sensual, animated, playful – changing her mood physically with what the song dictates. 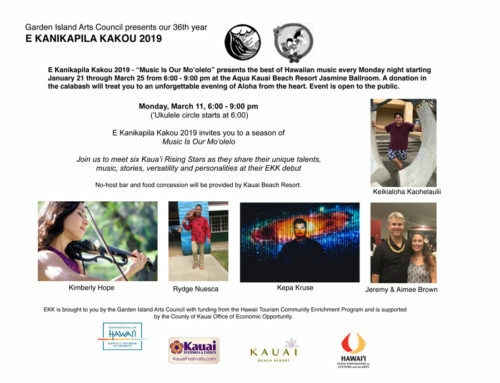 Last year she met and played with the group Ho’okena at the Ki Ho’alu Slack Key Festival on Kaua’i and later had another opportunity to play with them at Troy Lazaro’s hula ho’ike at KCC. They gifted her with a back track of the Ho’okena version of The Prayer, so her second song was an elegant rendition of this song. Huge applause really wow’ed her. She loves that music is such a universal language. Kimberly chose another original song titled Shine because it’s simple but expresses the light that we all carry within us. It’s all about each person’s shine and she encouraged everyone to let out their shine as she played. She did, indeed shine with her violin music; it’s a quiet shine but radiant with the glow that comes from within. It was mesmerizing to watch her play the violin, her “voice” of expression. Kimberly introduced Rydge Nuesca, who is one-third of the trio called Homesteads. Rydge introduced his accompanist, Michael Ruff who is a wizard on the keyboard. As they were setting up, you could hear Michael in his loud stage whisper, “It’s so quiet; it’s really quiet!” The audience was waiting in anticipation; Rydge and Michael did not disappoint. Rydge came prepared with three Hawaiian songs. “You guys like Hawaiian music? That’s all I know how to play,” he said, much to the satisfaction of the EKK audience. He sent out his Mom’s favorite song to her — You’re The Best by Kaleo O Kalani. He certainly has the makings of a crooner with that smooth voice. 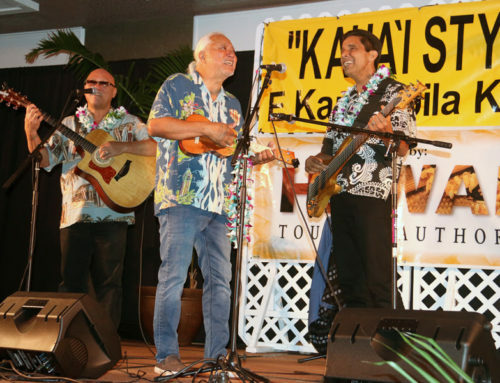 Kamaka Hikilani by Kuana Torres Kahele is a song that speaks about brothers, grandmothers and the importance of ‘ohana. From the huge group on hand to support Rydge, you could see why ‘ohana means so much to him. For his third song he sang Ali’ipoi which was composed by his Godmother’s Tutu. Mauli’ola Cook did not miss her chance to dance her awesome hula to this beautiful song. This mele was the complete package. Young good-looking Rydge singing his falsetto, a beautiful hula maiden bringing the song to life and Michael Ruff’s brilliant keyboarding was certainly not lost on the audience. Rydge introduced Kepa Kruse, a young singer making a name for himself with his unique compositions about local lifestyles and personalities. He calls it “escapism” songs that are funny, humorous comedy about life. A little girl in the audience asked him if he was going to sing the Guy Hagi song so he obliged by singing it first. Before he put it on air, Kepa ran the song by television weatherman Guy Hagi to be sure he was okay with it; Guy said he was flattered that someone wrote a song about him. 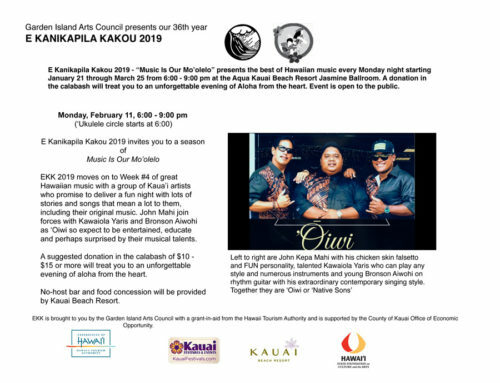 He said that there are three things about Guy Hagi in the song – he keeps saying the surf’s coming when it’s not, he keeps blocking Kaua’i on the TV screen, and he’s a super awesome nice guy. It was good Kepa shared the reason for the change in tone from verse one to verse three was because of what he shared in verse two — that Guy Hagi was a Golden Glove Boxing champion not to be toyed with. 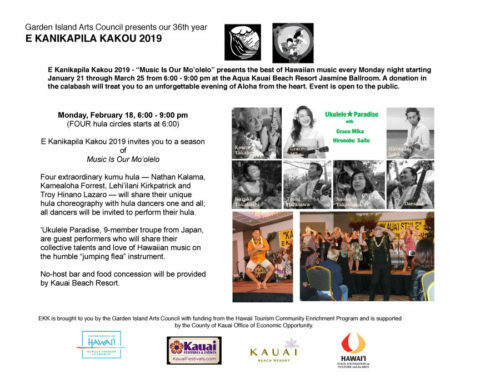 Kepa recently went to Japan where he performed his song to an audience of 1,000 at the Aloha Tokyo event; he’s happy that the song is catching on in Japan. His second song is about a favorite local pastime with a Japanese twist — Pass me a Biiru Kudasai. Because of his Japanese roots, growing up with a Japanese hanai mother, he wanted to write a Japanese drinking song. The audience loved the participation part where they could call out “kampai” whenever he sang about the beer. He was also happy that his late friend Masa-san from Masa Sushi was caught on the sound track shouting out “kampai”. Inspiration for his newest song called Slippahs was the result of breaking three pairs of slippers in one week . . . the perfect comedy for his life. In fact, we have all been there — leaving your best slippers on the porch at a party and coming out to find your favorite slippahs gone and having to go home with the simple humble plain rubber slippahs. He was happy to say that the day the song went on air, his father was stuck in traffic when he heard the song for the first time and it made his day. Kepa admitted that his real job is as an IT nerd who works on computers and that music was his side passion. ”Wow! What a treat!” he was so grateful to be part of EKK and acknowledged all the coordinators and his family in the audience. Kepa introduced Jeremy and Aimee Brown, who earlier taught the ‘ukulele hour. Jeremy said that every morning his I-phone alarm rings at 5:45 am with Kepa’s song Cruise opens with the words, “Where’s my phone?” Armed with guitar, ‘ukulele, cajon and great big smiles, they began with the reggae-beat song Koke’e Mist. Fall Misty Rain which they taught earlier in the ‘ukulele circle is a song that they learned in 2001 when David Kamakahi was teaching the ‘ukulele circle at EKK back in the parish hall at Saint Michael’s church. They asked David for his blessing to share the song with the EKK ‘ukulele circle. For their third number, they invited their Kumu Hula Aunty Puna Dawson to join them on the song — Ka Makua Mau Loa. What a beautiful harmony they shared in this song with Aimee on the first verse, Jeremy on the second verse and Puna on the third verse. Jeremy and Aimee were asked to play a little ditty on the Kamoa ‘ukulele that was to be given away this evening. Folks were invited to try their luck at winning the beautiful ‘ukulele. They sang the ALOHA song and the audience joined in. Due to the first set going overtime, the usual intermission time was omitted and the program went into the second half so that the artists would be able to collaborate on the songs and each artist would have a chance to perform a hana hou song. Jeremy and Puna led the singing of Aloha Kaua’i; Po’ai Galindo and Aimee Brown danced to the popular hula. Kepa Kruse and Rydge Nuesca, both on ‘ukulele, led the ensemble onSomewhere Over the Rainbow in the style of Braddah Iz and the very popular Island Stylesong recorded by John Cruz. Joining them on stage were Michael on keyboard, Kimberly on violin, Aimee on cajon, Jeremy on guitar and Keiki on the piano. It made for powerful music. EKK is big into audience participation so when Jeremy and Aimee Brown sang an original tune titled Coqui Was Da Sound, the audience was invited to join in as Kaua’i roosters, chirping coqui frogs and hunting dogs. What a racket! And to think that we survive all this in our daily lives. Jeremy wrote this after he had weird dreams about chasing coqui frogs. Where did the time go? With so much talent we could have gone on for another half hour but as the pumpkin hour approached, we managed to squeeze in Kimberly Hope’s hana hou; she performed Rise Up, an original composition based on various sounds in the environment. Once again, the evening was too short. The audience joined hands and voices to Hawai’i Aloha, ending an evening of artistry by Kaua’i’s own talented musicians. Surely, we will see these artists many more times in the months and years ahead! Two weeks to go in the 2019 season of EKK.